Distribution: The native range of the brook trout spans from eastern Canada (from Hudson Bay to Newfoundland) to the eastern United States as far south as Georgia and as far west as the Great Lakes and upper Mississippi drainages. The species has been introduced in several parts of the world including the western United States, Asia, Europe, New Zealand, and South America. Brook trout are more common in northern New Hampshire where inherently cooler summer air temperatures maintain suitable water temperatures. As one moves south, brook trout become increasingly dependent on groundwater streams as a steady source of cool water in the summer. Forested riparian zones and in-stream wood are important habitat features for a healthy brook trout population. Description: The species can be quite variable in coloration but still maintains a typical trout like body shape. The species usually has several spots (red or pale in color) surrounded with blue halos (outer circles). The main background of the fish can vary between red, silver, black, green/olive, or brown. The underbelly of brook trout can have a contrasting coloration ranging from pink, red, to yellow. Fins have distinct white boarders on the outer edges. Typical of all fish in the salmonidae family, brook trout have an adipose fin. The species has a slight or very shallow forked tail and rarely exceeds ten inches in the wild in New Hampshire. Species commonly confused with: Young-of-the-year brook trout can resemble other salmonids in the same age class. They all can have similar coloration, parr marks, and body shape. The presence of juvenile brook trout in a stream, as opposed to hatchery raised fish, is a sign that the stream is capable of supporting a wild trout population. Habitat: While brook trout can inhabit both flowing and ponded waters, they are more commonly associated with flowing riverine habitats in New Hampshire. These habitats must provide conditions with high dissolved oxygen and cool water temperatures. It is rare to observe brook trout in waters where summer water temperatures routinely exceed 70 F. In New Hampshire, brook trout are most commonly found in small to medium sized rivers and streams. Larger rivers tend to either lack habitat variability or suitable temperatures for the species. Brook trout require a combination of different habitat types within rivers and streams. Preferred habitat types can change based on the age or size of the brook trout. Generally, a river or stream with a mixture of pools, riffles, and runs enhanced by undercut banks and fallen trees will support wild brook trout. Brook trout and other aquatic organisms benefit from a well-established riparian buffer where pollutants associated with stormwater runoff are filtered, the stream is shaded and cooled, high flows have access to floodplains (to help dissipate erosive flows), and mature trees can fall into the stream to enhance habitat features. Stream crossings with natural substrate along the stream bottom are less likely to restrict the movement of brook trout. Life History: Brook trout are members of the salmon family, although they are more closely related to Arctic char and lake trout than they are to salmon. Their adaptation to streams with cool summer water temperatures makes them vulnerable to deforestation along streams and rivers which could increase water temperatures to intolerable levels. Brook trout are powerful swimmers and are often found in steep, cascading mountain streams where no other fish species are present. Though some individuals may live their entire lives in one small stream, radio-tagged brook trout have been documented to move many miles in search of thermal refuge, spawning habitat, and foraging areas. They are a relatively short lived species, rarely exceeding 5 years of age in the wild. Brook trout are efficient predators, usually taking up residence in a pool where they feed on both aquatic and terrestrial invertebrates. Often, adult brook trout will feed in sections of faster flows where boulders and rocks break up the strength of the current. Young-of-the-year brook trout typically occupy stream edges where current is less strong but food sources are readily carried downstream to them. Brook trout feed on essentially all life stages (adult, nymph, larvae) of aquatic macroinvertebrates. Rivers and streams with high sedimentation rates can impact aquatic macroinvertebrates. Mayflies, caddisflies, stoneflies, and other aquatic macroinvertebrates develop and mature under rocks and gravel and within the spaces between them. Sand or silt can cover and embed these areas making it difficult for macroinvertebrates to survive. Terrestrial invertebrates, including beetles, caterpillars, spiders, and grasshoppers, provide a significant source of energy during the growing season, while fish and aquatic invertebrates become the main food source during winter. Well-established, overhanging trees and shrubs provide a steady source of terrestrial invertebrates that are consumed by brook trout as they fall into streams. Brook trout seek out gravel beds with upwelling groundwater, often in small headwater streams, for spawning. These areas tend not to freeze during the winter months. Eggs are laid in small excavated nests in gravel, called redds, where they incubate through the winter and hatch in the early spring. Excessive sedimentation from upland erosion and road runoff can embed or cover spawning substrates. This can reduce spawning success and recruitment rates. Conservation/Management: Brook trout are sensitive to habitat disturbance. The presence of a healthy brook trout population is generally considered a sign of a healthy stream with good water quality. An intact riparian zone provides both shade and prey in the form of terrestrial invertebrates. Removal of streamside vegetation may cause a stream to become too warm to support brook trout. Impervious surfaces and undersized culverts increase peak flows and cause erosion and sediment deposition, which may fill pool habitat and bury spawning gravel. Fragmentation is an important limiting factor when it comes to maintaining healthy brook trout populations because impassable stream crossings prevent brook trout from accessing critical habitat, like a cold stream in the summer or spawning habitat in the fall. Promoting groundwater recharge by limiting impervious surfaces and using Low Impact Development (LID) stormwater management practices is critical for protecting brook trout populations in the remaining spring fed streams of southern New Hampshire. Brook trout are measured and weighed at each survey site as part of the ongoing brook trout status assessment for the Eastern Brook Trout Joint Venture (EBTJV). The Eastern Brook Trout Joint Venture (EBTJV) is a partnership between government and nongovernment organizations with the common goal of preventing further decline in the native range of the eastern brook trout. The EBTJV is the first pilot program funded under the National Fish Habitat Partnership. 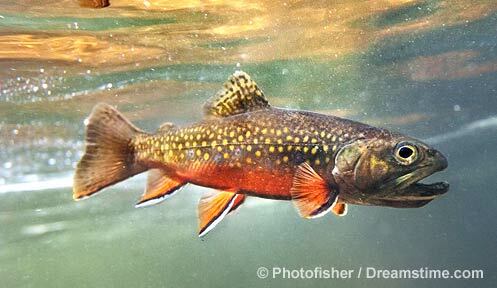 New Hampshire is fortunate to be a relative stronghold for intact brook trout habitat. As a partner in the EBTJV, the New Hampshire Fish and Game Department is conducting an ongoing status assessment of brook trout populations throughout the state. The results of this status assessment are used to make recommendations for restoration or land conservation projects that will benefit wild brook trout. Throughout the process, it is important to engage local and regional conservation groups interested in wild brook trout conservation and capable of implementing conservation projects. Some examples of organizations that have participated in the EBTJV in New Hampshire include: Trout Unlimited, the Newfound Watershed Association, the Lamprey River Local Advisory Committee, the Hanover Conservancy, and the Ammonoosuc Conservation Trust. Make recommendations for potential restoration or land conservation projects based on the brook trout survey data. Work with local conservation organizations to increase the awareness of brook trout conservation and help facilitate restoration work.